These are all toys I've had for MANY years, mostly from before I even got into the double digits. 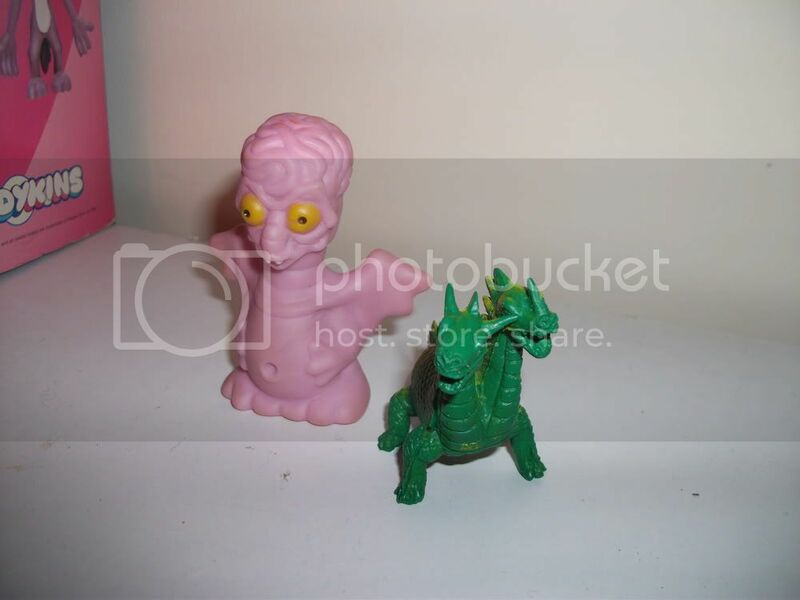 They were found again recently in the same box where I found the booklet for those Greek mythical monster toys. Anyway, anyone have any idea what this lot actually ARE? 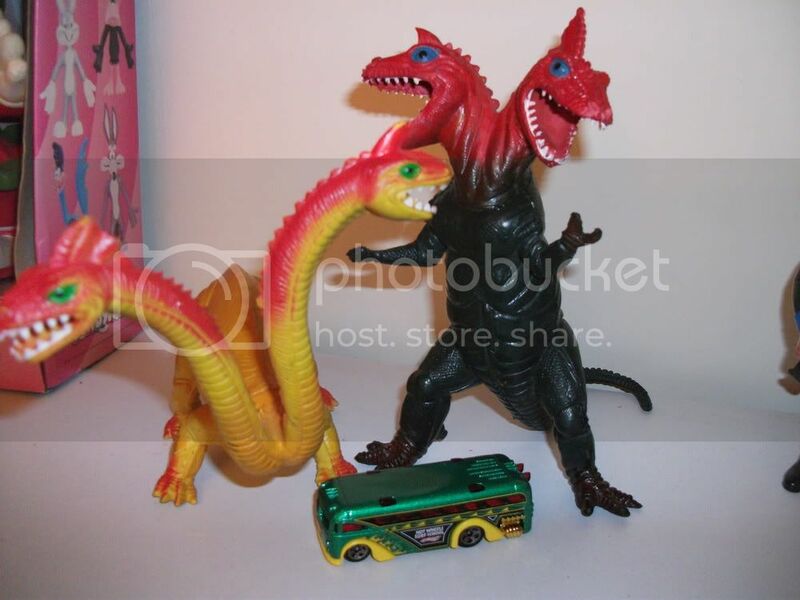 Two big vinyl two-headed dinosaur things, shown with a Hotwheels bus for size comparision. 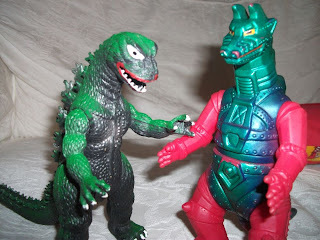 That Virtual Toy Chest website says that they're Imperial Monsters, but on researching those, these two aren't mentioned (or even similar looking). A small dinosaur, a Captain Hook-like being, and an absolutely TINY Frankenstein monster thing. He's maybe 1.25cm tall. 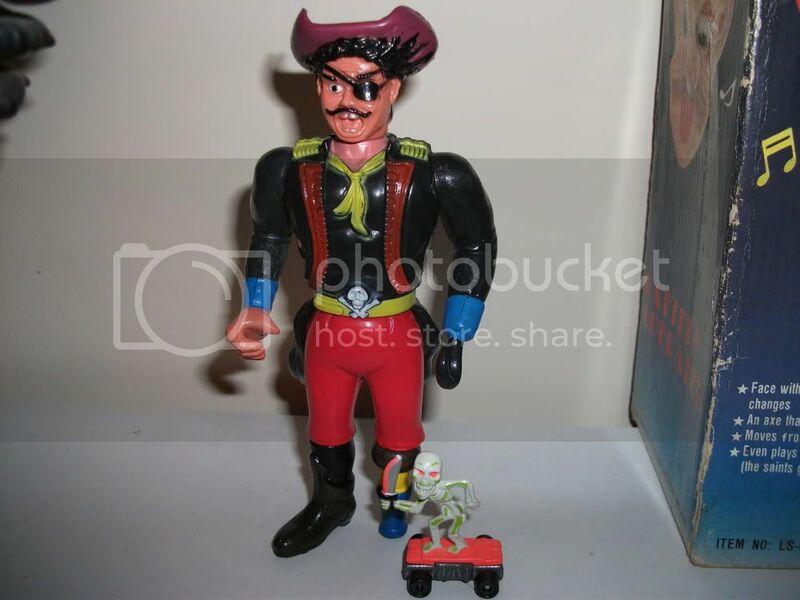 A tall, mad-looking pirate, shown with a Savage Mondo Blitzer for a sense of scale. 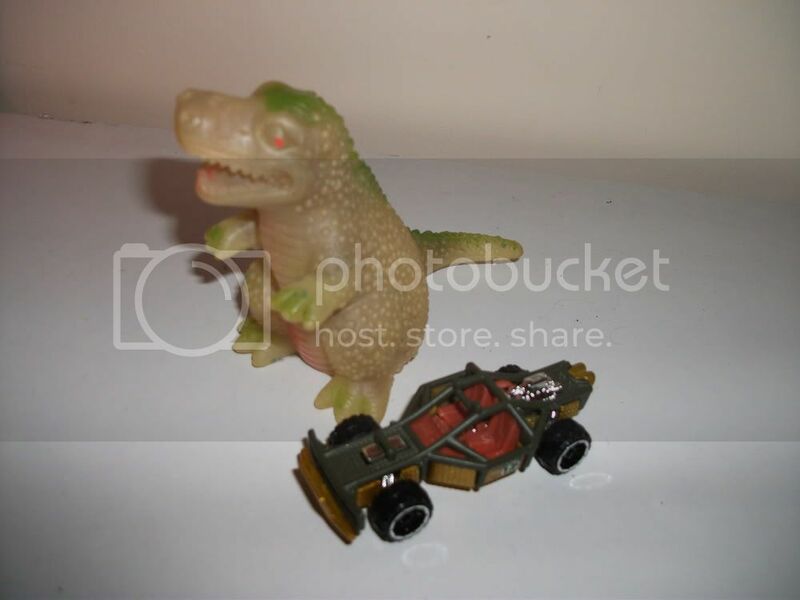 A squeezy, glow in the dark dinosaur, with a Hotwheels car for comparision. 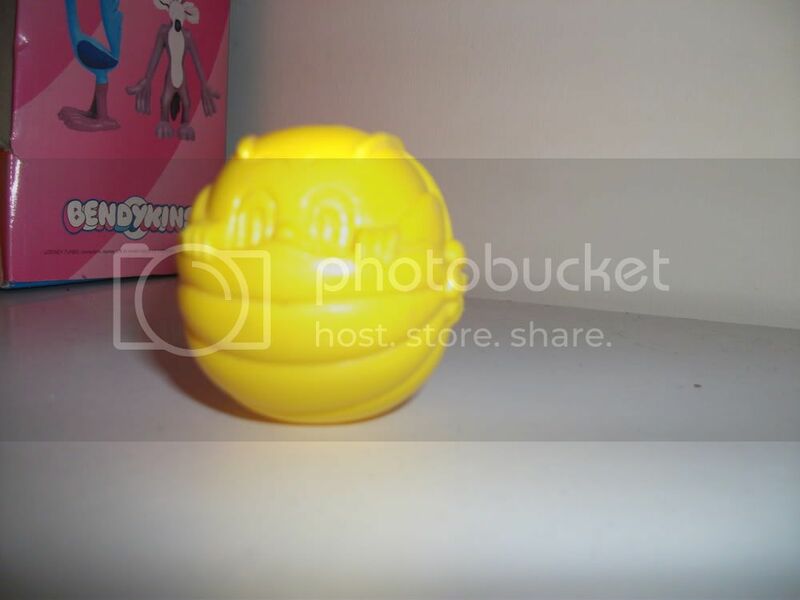 A hard plastic (yet hollow) ball depicting some sort of cute bumblebee. 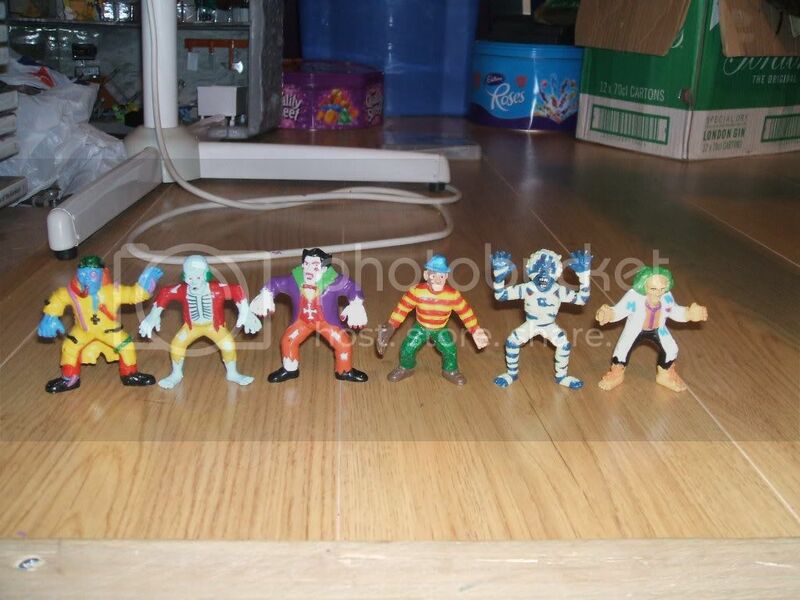 I remember these came in a big cardboard box, and I used to have loads of them. There was even a "baddy" in the form of a black beetle. Can't remember what they are though. 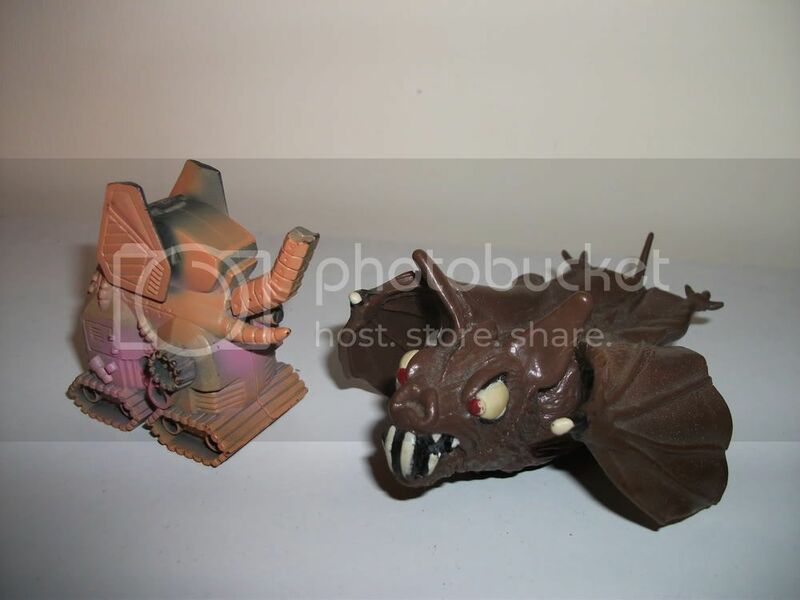 A robot elephant machine and a rubbery pull-back-and-go bat. 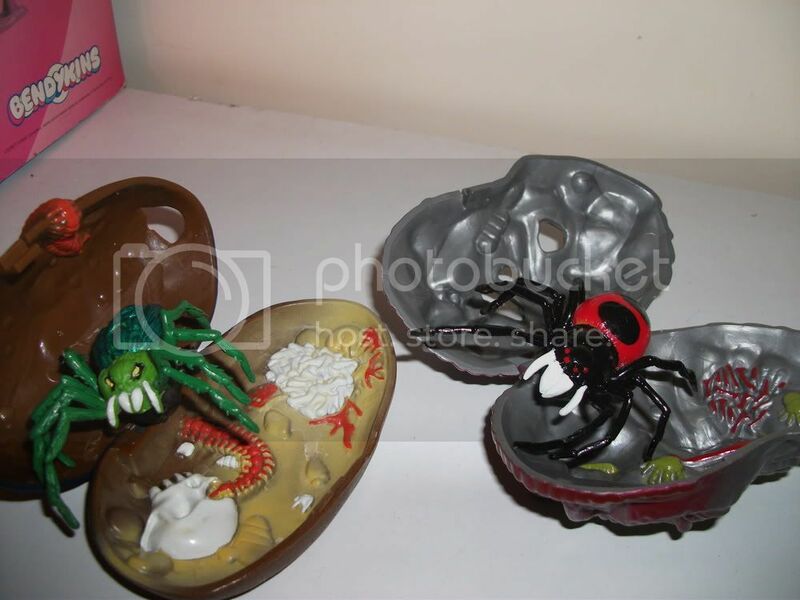 Plastic egg-shaped things that open to reveal rubber bugs with pull-back-and-go actions. Marked "Mattel 1994", but I'm getting nothing from Google. A quarter whom I am dubbing the "Killer Hero Squad" - the guy with the cricket bat says Kellogs on his back (looks like "Kellogs" anyway) and the beetle can be transformed into an egg. The dinosaur feels like an eraser. This big insect thing smells really bad for some reason. Maybe that's his weapon. A couple of freaky beings. The pink one is hollow, like he's supposed to go on top of something. Various things... Finger monsters/pencil toppers, a one-eyed robot man, a glowing Grim Reaper and a dinosaur that turns into an egg. Finally, I'm STILL trying to find out what these things are! That's no ordinary "dinosaur that turns into an egg", that's Gamera! He's really neat! I'm not sure on the manufacturer; possibly Takara or Tomy. 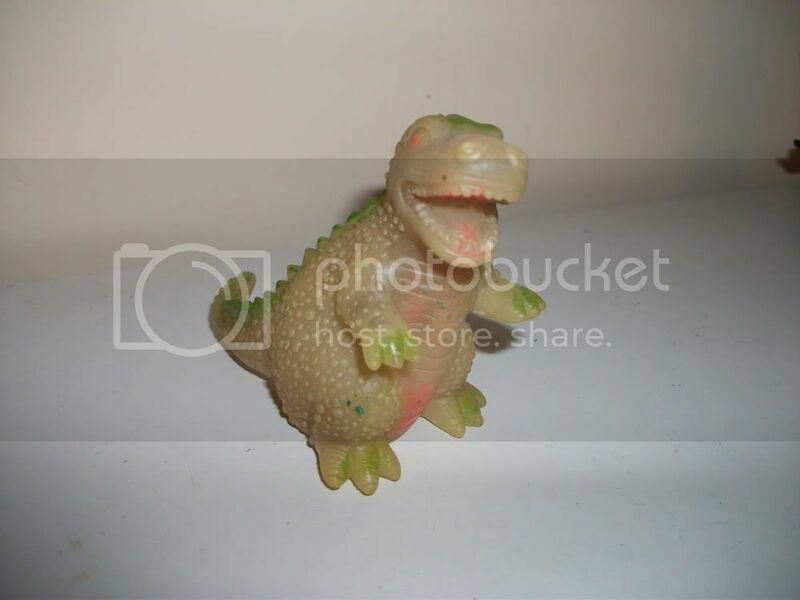 I also know that there is a more recent, possibly unlicensed version of the same mold sold with Godzilla and King Ghidorah eggs. The color on yours looks so perfect that I'm more inclined to think you have an original, but hard to say. 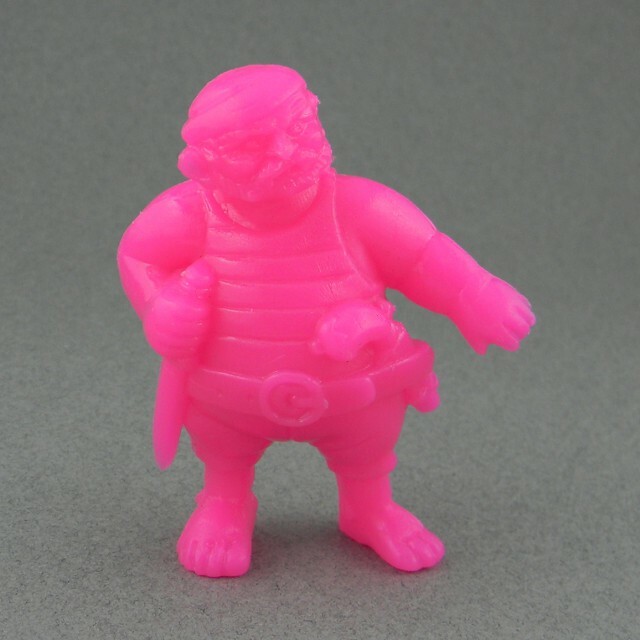 The little pink-ish Frankenstein is the accessory to a car toyline that's been posted here a few times before but the name of which I can't remember. He's just the driver that pops out of the roof of a ferocious monster truck. Ah wow, Gamera! Thanks! Just looked inside his "shell" and it says "Bandai 1987" along with some Japanese characters. As for the Frankenstein thing, now you mention it I have memories of him sticking out the roof of some vehicle or other. I'll have a look around and see if I can find said vehicle. 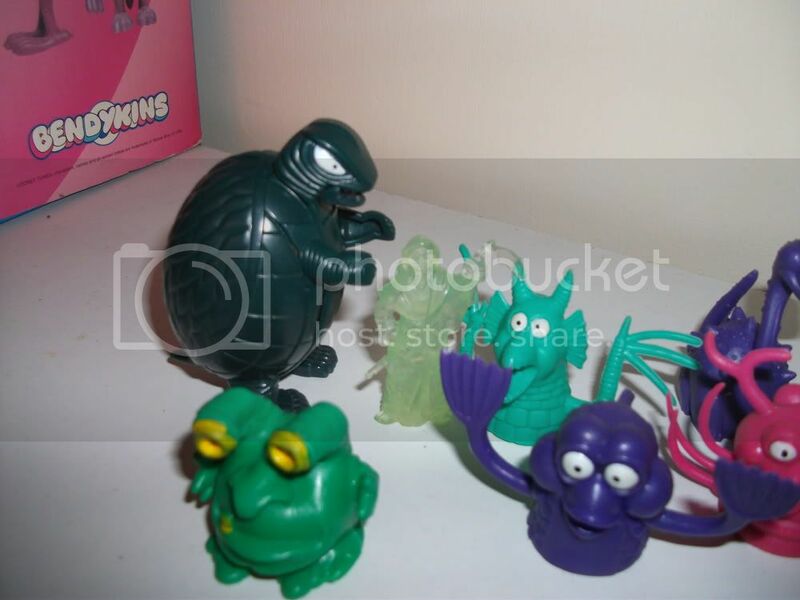 The Gamera is from the Uk version of the Toy LIne Egg Monsters so is the Insect. I had the Gamera one but it broke. 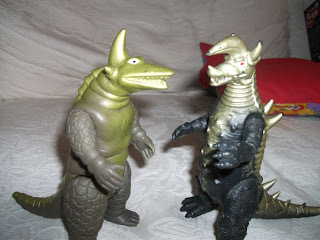 My Favourite Egg Monsters I own sadly the Figure itself does not come with a Axe. 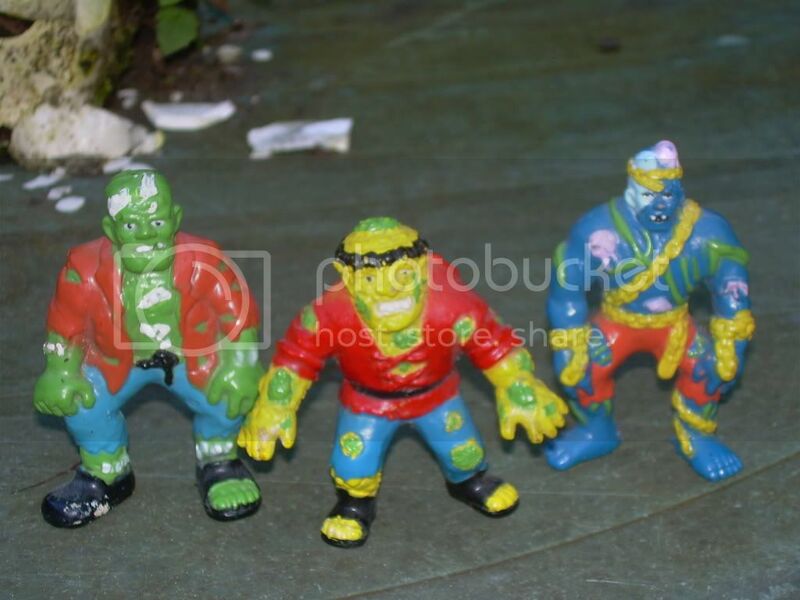 Certain countrys versions of these came with Little black unpainted figures of things like Snakes,bats and evebn a little SD franensteins monsters holding a scalpel. Little Red Franksteins monster looks like its from a car Zilas. 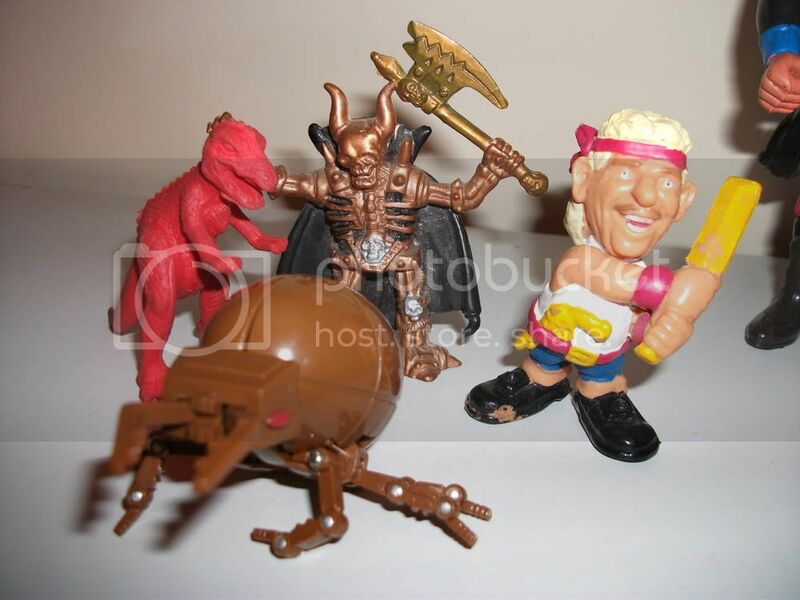 The Rubbery Bat is from a mid 90's Mattel line. They was larger Plasic ones of a Rat,Spiny Toad and a Spider has well that was electronic and had light up eyes. 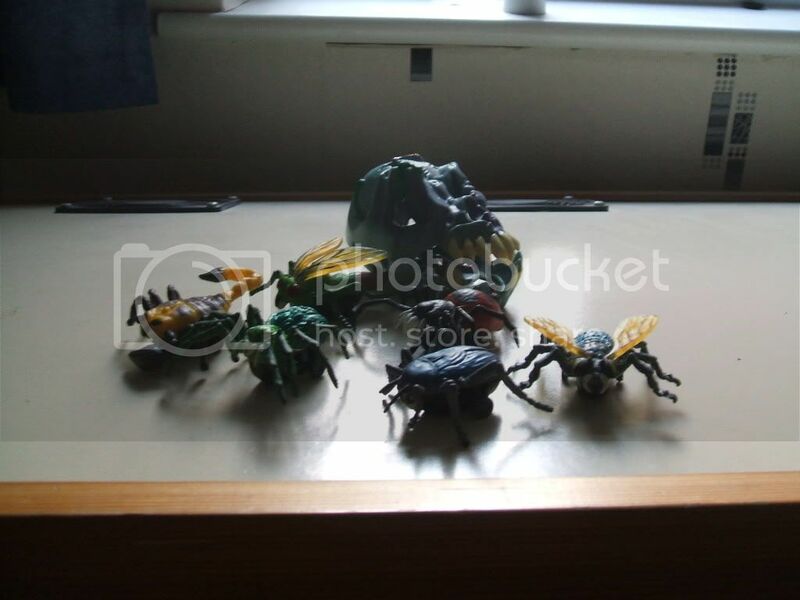 The containers with Insects in are from the Same Toy Line Each container had two diffrent colour stlyes. but i do not know its name. 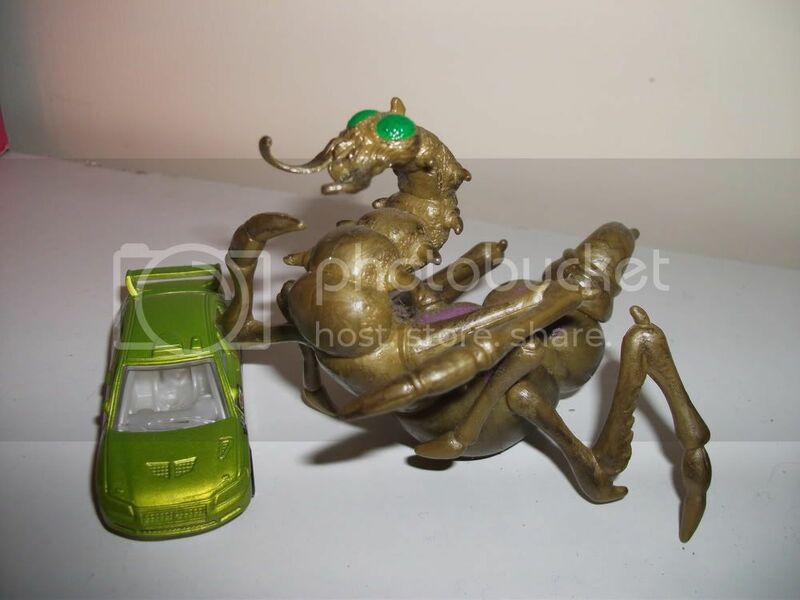 The Gold insect is from a Trendmasters toy line where you disceted them they had small bugs inside them. THe Green one Eyed guy is from Computer warriors. The Green stalk Eyed guy, Yellow Blob and Red nosed guy are from The Gunge Game board game by Wadingtons . This game was one of my favourites as a kid and I still have it. Still a great fun game easy to play to and no game takes forever either. 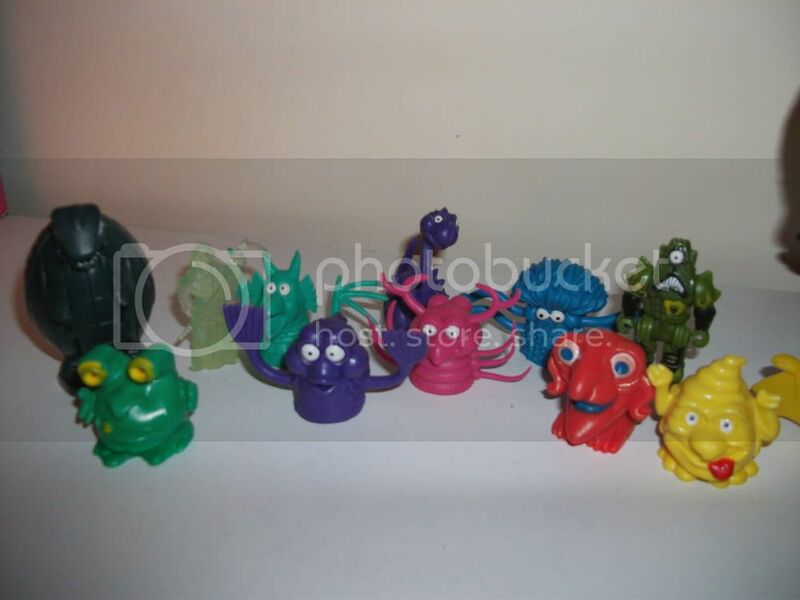 The Green Guy is called Yuck and lives in the sides of food jars. The Blue guy is called Crud and lives in refrigerators. The Gold Skeleton is a Chap Mei Toy they is two others in the series one with a black cape and a sword and sheild and another with bat wings carrying a spear. THe Cricket guy is ment to Iam Botham If i remember corectly another in the same line is Frank Bruno holding a Teddy Bear. They was made by kellogs im sure there on Yowiemagie somewhere. Edited by Acidonia, 26 March 2011 - 01:08 PM. That's a lot of information, thank you very much! I have a skeleton that says Egg Monsters on his inner rib cage, didn't think they'd all be of the same set. That Jason/Rick one looks great. 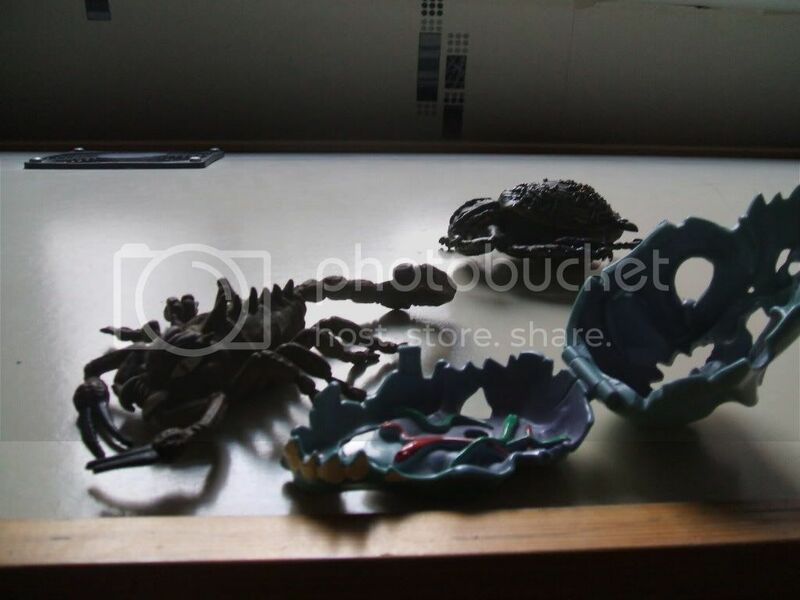 As for the insect-container things, I'm sure I have that skull somewhere as well, because I remember making the legs of whatever insect was inside poke out through the teeth. Your sure the bat's from the same line? If so, it's probably the best line ever, whatever it is! That Trendmasters insect dissection line, I'm intrigued. Sounds like a lot of fun, and something I must track down. Never heard of Computer Warriors, but it's a fun enough figure, so that's good. 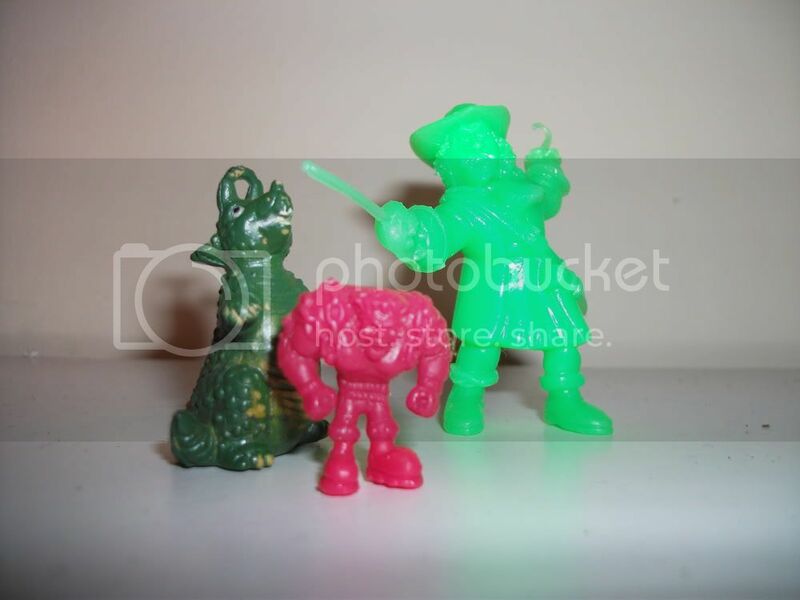 I must've owned the Gunge Game at some point, because I have four of each of those figures, but can't ever remember a board game being attached. Board Game Geek doesn't even have an entry on it! A Gold Skeleton from Chap Mei toys is a nice thing to have, seeing as last time I put a load of figures on this board it was found I had a Chap Mei purple-cobra warrior thing, so that's good. Yeah, lots of stuff there, thanks very much Acidonia! The insect dissection line was called "Operation B.U.G." but difficult to track down. I love those pull-back bugs, I have the scorpion but would love to own more. The first two dinosaur things are probably generics. As for the dinosaurs, seems ALL the best ones are "generics"! So... No-one knows what the robot elephant is? I could have sworn that was an alien from Men In Black. Turns out the bugs-in-eggs are called Horror Pets. It all came flooding back instantly as soon as someone told me, even the packaging! That's a pretty cool lot of toys there. I would like a Chap Mei gold skeleton guy just like that. 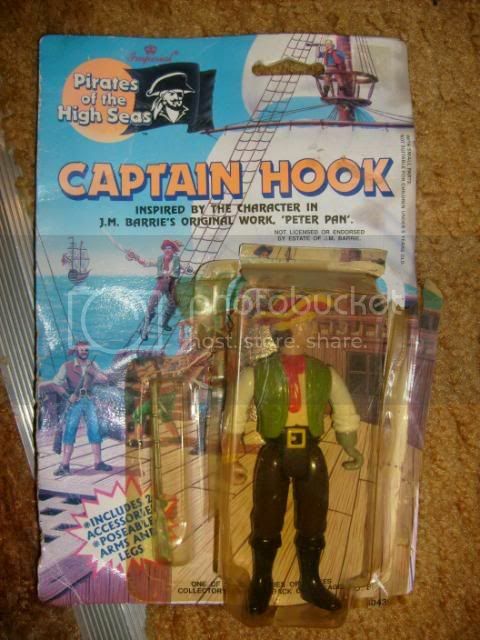 My favorites are the one of a kind, cheaply produced toys that don't even come with a name. 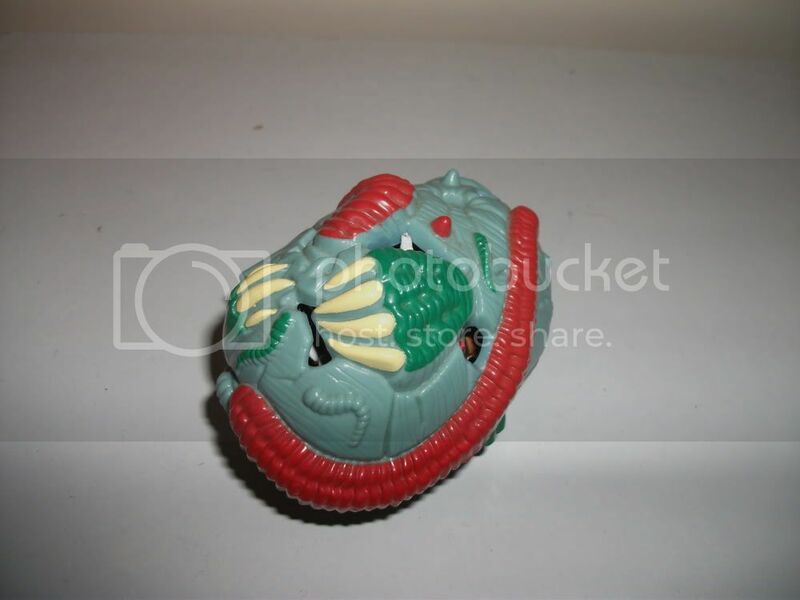 Something like that purple cobra warrior thing, I have one that has three different heads that rotate on ball joints. I remember there was some kind of green gargoyle in the same line. 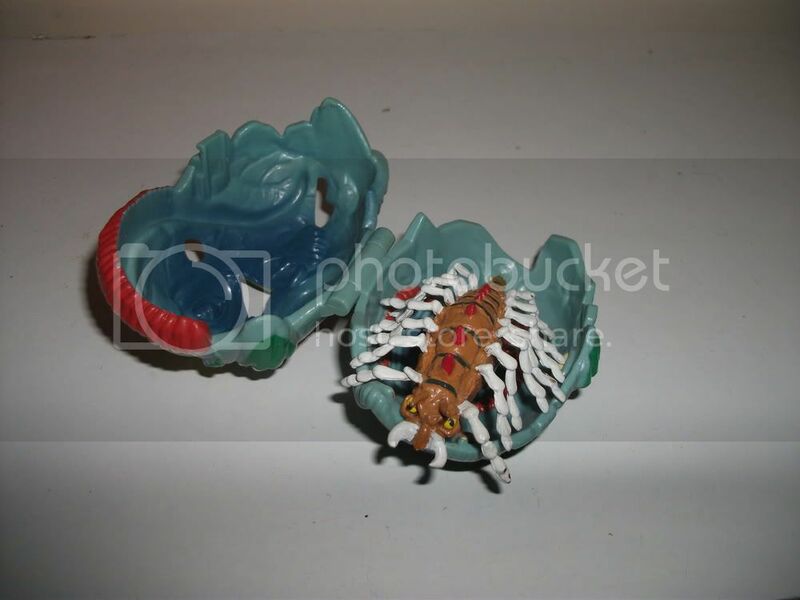 Yeah, I put that purple three-headed cobra thing in my last toy-ident thread - wonder how many more Chap Mei things I have? Got some strange robots and aliens sitting around without any names, I'll be posting those up here soon enough (or when the Robot Elephant is identified, whatever comes first). Here's a few more things I've had for as long as I can remember. It's time that they were named! The two small aliens/robots/whatever have no markings, and are of a bendy, sticky rubbery ilk (but they can still stand up). The bigger robot is hard to make stand up (hence the weird pose), and has the markings: Malaysia © 1986 L.E.G. The robot dude on the left is a Blastaar Ground Guardian from the Captain Power line. Every once in a while I think about army building them since I come across so many, but then common sense kicks in. I have a few really cool tiny monsters from the toy line, I think they'll look great in front of the larger toys, eventually, when i have my monster shelf. 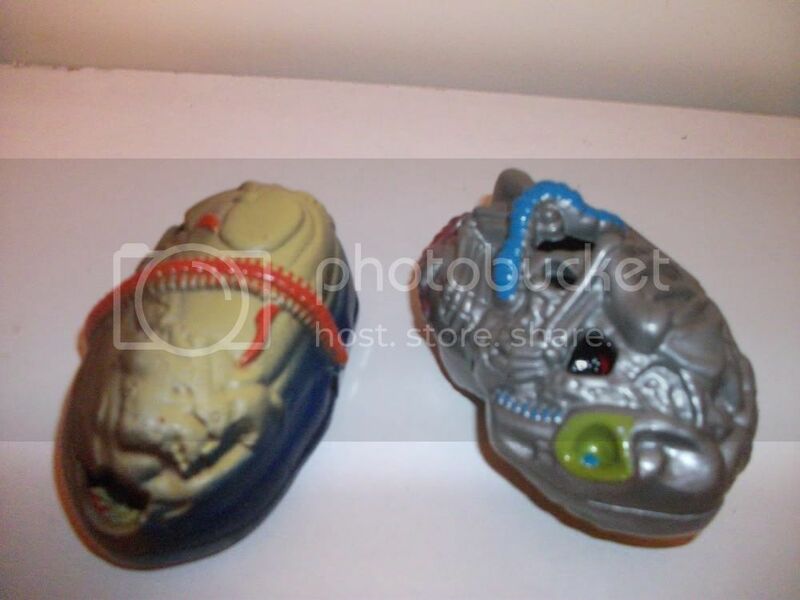 I do not know what the Two sliver aliens are from but they have weird shaped bases because they fit into Metal Painted Bases that did have some copyright on them sadly I do not know what. Ive got a few one is simlar to the right one but with a red helmet and black body. Have a Few that are Green Skined aliens some where some have stalk eyes whilst other are one eyed. They have a orange core in their chests that I think you could place their weapons in instead of their hands holding them. 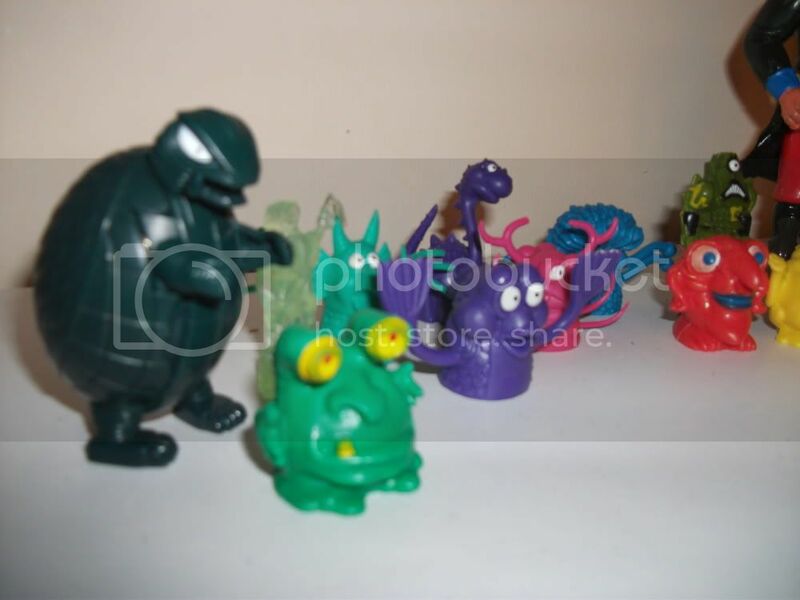 The ones I have though are hard plastic and the Green Aliens ones have moveable legs arms and heads. 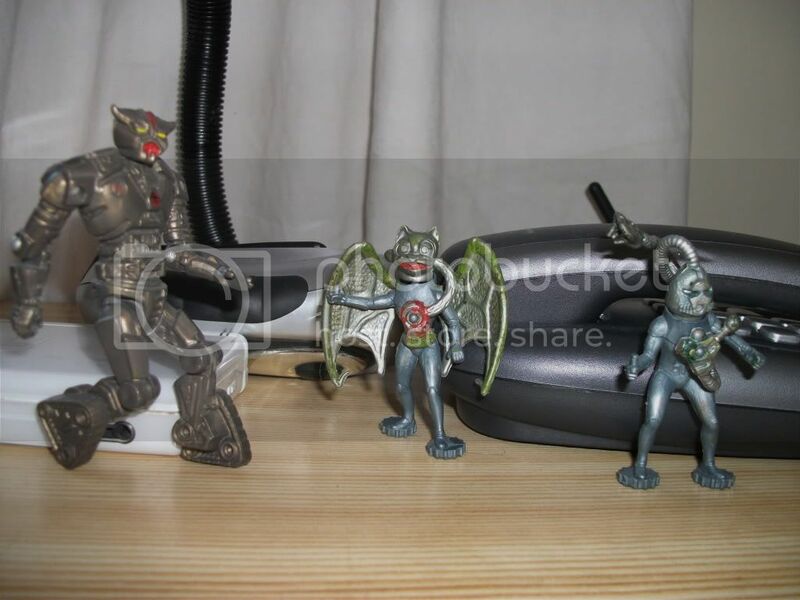 I do not know what the Two sliver aliens are from but they have weird shaped bases because they fit into Metal Painted Bases that did have some copyright on them sadly I do not know what. 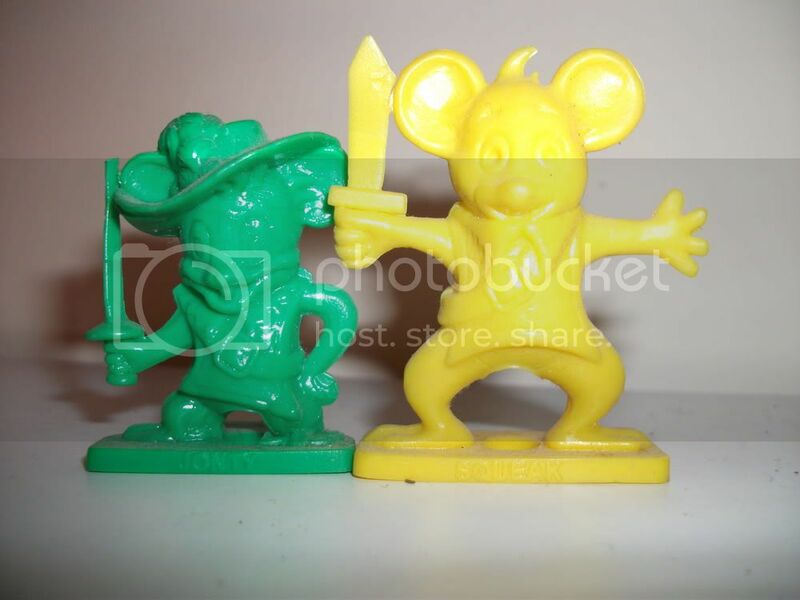 I had that green spaceship and a yellow one too. Edited by Strontium Dog, 29 April 2011 - 09:16 AM. Wow, those Britain's things look amazing! Going to start looking for more of those as soon as the money situation picks up again. Thanks also for the Captain Power ID. Never heard of that line, but mustn't've been very well distributed round these parts - me and my brother both got given that same robot figure. You should definitely check out Captain Power! The vehicles came equipped with light-sensor/laser kind of things that were meant to be used while watching either Captain Power videos you could buy or the short-lived Captain Power live-action show. You could shoot at weird lights that would appear on the screen and could also be shot by the same lights. Oh yeah, you could also play crappy laser tag with the vehicles, but I never really did that as a kid because my friend broke his immediately after getting it. Man, I'm off to youtube to look this up. NEW THINGS! Should be a bit easier, these ones. Got a nice little set of knock-off monsters through the post this morning. One of them's obviously Godzilla, but what about the other three? Edited by TheRiddler, 07 August 2012 - 05:27 PM. These aren't quite 13", more like 8" - nice to finally have a "variant" of the Imperial Godzilla though! The yellow-bumpy thing says "1998 China" on its back and nothing else. The tiger-headed wrestler is non-poseable. The other three are ripped off of existing vinyl figures from Japan. The one next to Godzilla is Mechagodzilla, while the other two are Telesdon and Black King from Ultraman. if that green pirate wasn't ever id'd..i'm pretty sure its from yolanda's pirates line...not sure if that's the official name though! Edited by TheRiddler, 07 August 2012 - 06:43 PM.